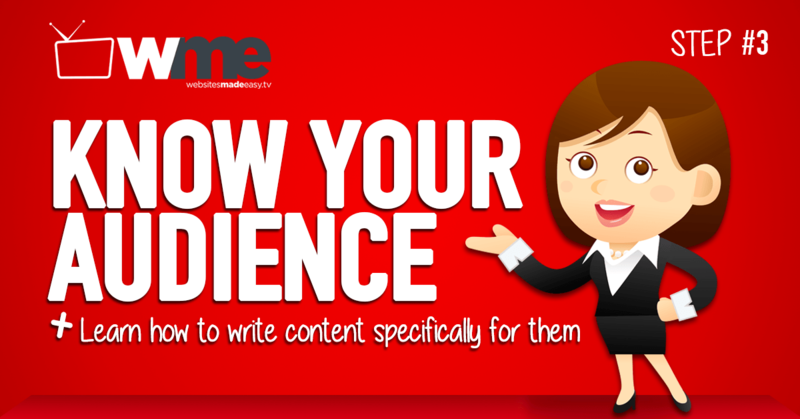 Before creating content, you must consider which audience you are creating content for. What type of person is most likely to buy or become a client? What does this person want to know about my business? Which social media channels are best to reach him or her on? What tone is best used in order to reach your intended audience? What outlets can you use to promote your content on? On which outlet does your target audience currently prefer to spend their time? Do they prefer to consume content through video, podcast or other audio, by reading articles, reports, quick posts, etc. No matter how good your content is, without actually speaking to the needs of your audience, your efforts will be a waste of time. Rather than just posting any old thing, focus on your customer and what they want to learn. What is it that bothers them? What specific problems do they have? How can you meet them where they’re at, speak their language, and communicate your values to them? One way to be sure you really understand your audience is to categorize them and create a profile for them. Who are they exactly? If you were to pick your target audience member out of a crowd, what would they look like? What would they be doing? Answer these questions and be as specific as possible. A member of your target audience is a person that has a unique demographic and set of core values. For example, your target audience member may be a 42 year old Caucasian female named Karen. She is married with 2 kids living in New York City, NY, has earned a masters degree and makes $60,000/year. Karen enjoys playing tennis and other outdoor activities with her dogs. You will be using a specific profile like the one above in order to focus your overall style and communication. From everything you communicate, even down to your email subject lines, your style ought to be directed toward this individual. Whenever you write your next piece of content, think of Karen and what she would want to know, how she could benefit from this post, and how she prefers to hear about it. A survey service we recommend is SurveyMonkey.com. This tool is free to sign up and can be integrated with an email marketing service such as MailChimp. Another thing to keep in mind is that we can’t simply write one piece of content for our entire target audience. Your audience will be at different levels of commitment than others. So, your target audience must be divided into segments. For example, let’s say you’re a shop that sells golf clubs and golf equipment. And let’s consider Karen split into 3 segments. Intermediate: Karen may have played a few years with her own clubs and is ready for a replacement or a slight upgrade. These are 3 basic segments of our same target audience. So, we’ll need to create 3 articles right? Yes, but even an article specific to each segment may not speak to their exact needs. This is because each of these 3 segmented groups will be at varying phases in their buying cycle. Because of this, you’ll need to create content that speaks to each phase of each segment. For best results in your overall content marketing strategy, you’ll need to create content for each of the 3 phases of each of the 3 segments. Segment 1: Karen is just starting out with learning how to play golf. Phase 1. Awareness: Write a piece on what each different club does and how they each contribute to someone’s game. Phase 3. Decision: Share a video or an article on a specific set of clubs you recommend and why so many of your fans love them over any other. These 3 pieces of content all speak to the same Karen who is in our 1st Segment, “Karen who is just starting out.” Each piece of content leads the individual down a path toward a purchasing decision by first becoming aware (Phase 1), then considering the options (Phase 2), then making the decision (Phase 3). Here are examples for segments 2 and 3 just to give you some idea. Segment 2: Karen is an intermediate player who is looking to up her game a bit. Phase 1. Awareness: Write about the health benefits of playing golf twice a week. Detail how this consistency improves mental and physical performance in day-to-day life. Phase 2. Consideration: Write a piece detailing each of your employees who are qualified trainers and “experts” in the industry. Present information about your store and your all-star team of trainers. Phase 3. Decision: Create an article that details an invitation to an open-house event where you will be having customers come in and “test-drive” some of your intermediate equipment. Create a video and a flyer to post on your social media channels. Segment 3: Karen is looking for the top of the line equipment as she is ready to go pro. Phase 1. Awareness: Write a review piece of the top 10 courses across the country. Phase 2. Consideration: Share a video review of your top clients who have used equipment from your shop before. Perhaps they are other professional golfers that can give you an endorsement for your shop. Phase 3. Decision: Write about an upcoming event or product launch within your shop. Pitch for your training course, meet and greet event, or detail your sponsorship of a local professional event. So, as you prepare to create content, you’ll need to consider each of these scenarios for your own target audience. How can you segment your audience and speak to each segment’s specific needs. What content can you create that aligns your business to your audience’s needs and ultimately helps move them toward a purchasing decision? Now that you’ve got your target audience identified, have them segmented, and have an idea of how to speak to each phase of their buying cycle, you’re now ready to develop your plan of attack! In our next step, we cover exactly how to do this from developing a content calendar to creating your first few articles! You’re going to love this! Thank you for this informative post, James. It’s very helpful. I am still at a stage where I want to focus on building traffic and not sales, as of yet. My mission for my site is to deliver informative content about a Chinese culture (food, movies) to enable interested readers to become more engaged. I struggle with zeroing in on my target audience difficult as topics about food and movies alone can be quite broad. Any tips? Do you provide some consulting service? Thanks!